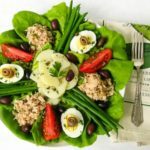 A recipe for tuna salad nicoise; a French salad Adapted from a recipe by Julia Child. Blanch the haricot verts in boiling water for 2 to 3 minutes and transfer to an ice water bath. Once cooled, drain, dry, and set aside. In a small bowl, add the tuna and stir in a little of the dressing. Set aside. Line a plate or platter with the lettuce. Drizzle the lettuce with olive oil and sprinkle with salt and pepper. Place the potato salad in the center. Arrange the tuna, haricot verts, tomato wedges, and eggs around the potatoes. Roll up the anchovy fillets and place one on top of each egg half. Drizzle or spoon the dressing over the salad. Scatter the olives, capers, and parsley on top. Serve immediately.